Impressive battery life with up to 77 hours music playtime. Samsung Galaxy Sky S320VL is an Android Smartphone with a 5-inch display that comes with an incredible 16 GB internal storage. While it's entirely an entry level gadget, having a Super AMOLED high definition display is a major highlight. I have had a hands-on experience with the Samsung Galaxy Sky and can say without doubt that it's a phone you can rely upon without having to spend too much. So, I am going to jump straight into the review, but first, what you get in the box. When I first opened the box after my shipment arrived, here is what I found. A wall adapter, a standard USB cable, a plastic back cover. A removable battery is also in the box and the Samsung Galaxy Sky S320VL device itself. So I installed the battery and snapped the back cover in place. Just to mention, it doesn't feel too heavy in hand. The outward appearance of the phone is quite appealing, as expected from Samsung gadgets. On the right-hand edge, you get the power button. At the bottom, you will notice a pin-like hole which is the microphone of the phone. Coming to the left-hand side are the volume buttons. Similarly to most phones, the earphone jack and noise cancellation mic sit on the top edge. To the back side of the device, we have a 5 MP camera with a flash and also the speaker just adjacent to the camera. The back cover is removable to get access to the battery and sim card slot. The battery is removable as well. Coming to the front panel, we have the 5-inch display. At the bottom of the screen, there’s the home button in the middle. On either side of the home button, there's a back button, and a recent apps button which although do not light up, they are easily visible. Samsung Galaxy Sky S320VL ships with a 5MP camera at the back and a front facing camera of 2MP. The pixel sounded small to me until I opened the camera app and started taking photos. They all came out bright which I found to be impressive for a phone within its price range. The autofocus feature allows quick capture so that you do not miss a moment. Surprisingly, the 5MP rear camera can shoot 720p videos with no noticeable lose of details. These videos and images show up brightly on the Super AMOLED display. The camera has several features implemented, such as Auto-mode, Pro-mode, Panorama for a wide angle still photo capturing, continuous shot, beauty face, sports mode that lets you capture fast moving objects without blur, and voice capturing. The Samsung Galaxy Sky S320VL has an incredibly large internal storage capacity of 16 GB. Most people prefer storing their pictures, songs, and documents on their phones, and the Samsung Galaxy Sky will suit your needs. I have had the gadget for a couple of months and no regrets whatsoever in terms of storage running out. While I found the internal storage incredible, the phone also supports memory expansion up to 128GB, with a dedicated microSD card slot. The Samsung Galaxy Sky comes with a 5.0" Super AMOLED display. Samsung always goes overboard with display technology, Super AMOLED displays being their major branding point. What do you get from this? An amazing display with 720 x 1280-pixel resolution that gives you a bright full picture and an amazing media viewing experience. The technology on the display lights up each pixel independently ensuring the best clarity ever. It is the same technology used on Samsung's flagship smartphones and televisions. I personally felt this phone bringing out clear photos and videos than other phones within this price bracket. Outdoor usage is also a major factor when buying a smartphone. With the Galaxy Sky, there is no noticeable lose in clarity while operating your phone outdoors, we can also attribute this to the Super AMOLED technology. Battery life is something I always consider when going for a new phone. Straight from the box, you will notice the battery capacity which is 2600mAh. That is some incredible juice. The battery can withstand a 25-hour talk time, 13 days standby, and up to 77 hours of music playtime. I used the phone to perform a couple of tasks for a full day without recharging. Such tasks included switching between several apps, gaming, browsing the internet, making phone calls and chatting. The impressive performance of the Samsung Galaxy Sky S320VL can be attributed to its 1.2 GHz Quad Core Processor. This processor, backed by the 1.5GB of RAM can handle most user tasks. I was even able to play some light games. Browsing using a heavy browser like Chrome is excellent; I didn't notice any freezing of the phone when scrolling or switching between tabs. Availability of a recent apps button assists with navigation between the apps you have been recently using. Switching between apps is smooth and fast as recently opened apps remain in a dormant state – they do not have to restart when switching between them, thanks to the 1.5GB of RAM. Samsung Galaxy Sky S320VL comes with the smooth and fluid Android 6.0 Marshmallow. This version of Android comes with great features, and it's probably one of the reasons you should get yourself a Samsung Galaxy Sky from Straight Talk, Tracfone Wireless or Total Wireless. Such features include voice search directly from the screen, Google Now on Tap, check if your device security is up to date, toggle on and off app permissions, option for customizing the user interface, and of course the Easter Egg game. Samsung Galaxy Sky has a superb feature called Easy Mode. By turning on easy mode, you simplify your experience. The phone will show fewer apps, larger icons, and simpler interactions. You get things done quickly by a quick access to your favorite applications. 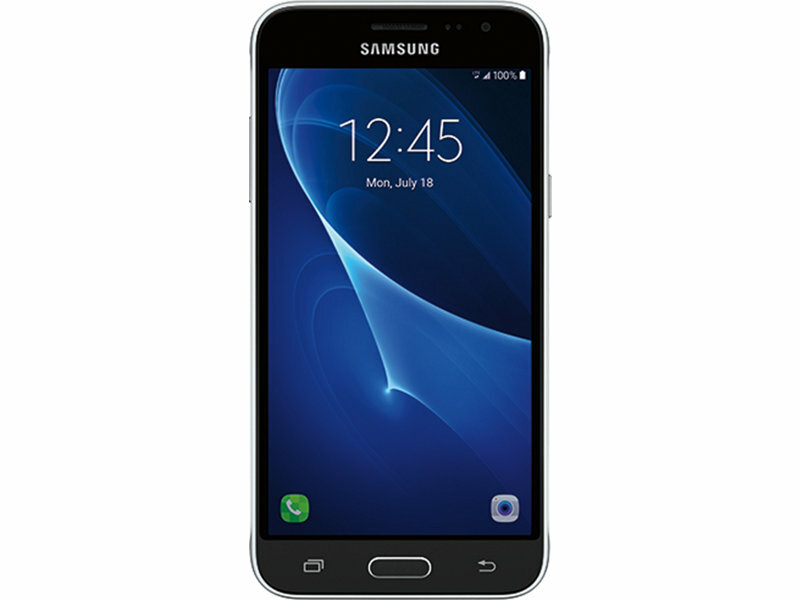 Samsung Galaxy Sky S320VL is capable of 4G LTE and supports CDMA that operates on Verizon network hence accommodating the Straight Talk plan. It has Wi-Fi and supports Bluetooth 4.1. For maps and navigation purposes, it has a GPS capability. It supports Bluetooth 4.1 for easy file transfer between nearby devices. 5 MP back Camera/ 2 MP front camera. Storage: 16GB ROM (Supports 128GB microSD card not included). Talk time up to 25 hours. 5.60 (Height) x 2.80 (Width) x 0.31 (Depth) inches.